Scientists from the University of Missouri have published an analysis indicating that regulatory testing for endocrine-active substances must be changed radically if there is any hope to detect developmental disruption at low contamination levels. They conclude that current methods are physically incapable of revealing low level impacts mediated by hormone receptors, because at the high levels used, the receptor systems will be saturated (swamped) and incapable of showing any response to changes in contaminant dose. Under these circumstances, it is literally impossible to extrapolate from commonly-used high level experiments to the risks created by low level exposures. Three recently published (Fall 2001) studies using laboratory animals of the low dose effects of bisphenol A (BPA) reinforce public health concerns about the possible impacts of this ubiquitous plastic compound. In one, Dr. Caroline Markey and colleagues describe effects on mammary gland tissue in adult mice after exposure in the womb that raises plausible questions about BPA involvement in stimulation of breast cancer. In a second, Jorge Ramos et al. report on impacts that low level BPA exposure has on adult prostate, the details of which resemble processes involved in human prostate cancer. And the third, by a scientific team from Japan led by Dr. Motoharu Sakaue, demonstrates that BPA suppresses sperm count in adult mice. Added to already disturbing information about BPA impacts, these new studies highlight the need for an urgent reconsideration by FDA and EPA of the need for better protections for people from BPA exposure. Markowski, VP, G Zareba, S Stern, C Cox and B Weiss. 2001. Altered Operant Responding for Motor Reinforcement and the Determination of Benchmark Doses Following Perinatal Exposure to Low-Level 2,3,7,8-Tetrachlorodibenzo-p-dioxin. Environmental Health Perspectives 109:621-627. US National Toxicology Program's scientific peer review of low-dose effects of endocrine disrupting compounds. October 2000. Ulrich, EM, A Caperell-Grant, S-H Jung, RA Hites, and RM Bigsby. 2000. Environmentally Relevant Xenoestrogen Tissue Concentrations Correlated to Biological Responses in Mice. Environmental Health Perspectives 108:973-977. Gupta, C. 2000. Reproductive malformation of the male offspring following maternal exposure to estrogenic chemicals. Proceedings of the Society for Experimental Biology and Medicine 224:61-68. Gray, LE, J Ostby, E Monosson and WR Kelce. 1999. Environmental antiandrogens: low doses of the fungicide vinclozolin alter sexual differentiation of the male rat. Toxicology and Industrial Health 15: 48-64. Christian M and G Gillies. 1999. Developing hypothalamic dopaminergic neurones as potential targets for environmental estrogens. Journal of Endocrinology 160:R1-R6. Welshons, WV, SC Nagel, KA Thayer, BM Judy, and FS vom Saal. 1999. 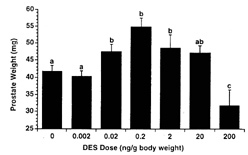 Low-dose bioactivity of xenoestrogens in animals: fetal exposure to low doses of methoxychlor and other xenoestrogens increases adult prosate size in mice. Toxicology and Industrial Health 15:12-25. Experimental manipulation of serum concentrations of several synthetic estrogenic compounds causes an increase in the prostate size of the exposed male mice once they reach adulthood. The concentration of the contaminants necessary to produce this change is extremely low: as little as 2 parts per billion of bisphenol A, .02 parts per billion DES, and 20 parts per billion methoxychlor caused significant increases. The research on DES and bisphenol A had been published earlier. This paper presents new data on methoxychlor. Rice, DC and S Hayward 1999. Effects of postnatal exposure of monkeys to a PCB mixture on concurrent random interval-random interaval and progressive ratio performance. Neurotoxicology and Teratology 21:47-58. Rice and Hayward report that male monkeys that had been dosed with a low level PCB mixture (7.5 parts per billion, representative of the doses typically found in human breast milk) differed significantly from controls in one of the measures used to assess their behavior. "The PCB-treated monkeys emitted more responses than controls over the first few sessions of the PR (progressive ratio schedule), which may be indicative of retarded acquisition of their steady state PR performance." Rice has commented in scientific lectures that the treatment level (7.5 ppb) was misreported to her before the onset of the experiments, and that had it been reported properly (the value given was much higher than 7.5 ppb) she would not have done the experiments because it seemed unlikely there would be any impact. As discussed in Our Stolen Future (Chapter 7), RE Peterson's lab has shown that extremely low doses of dioxin experienced in utero can disturb reproductive function and behavior in adulthood (Mably et al. 1992a,b,c). Here, MacLusky et al. show that fetal exposure to a low level of dioxin (0.7 µg/kg or 0.7 ppb) "disturbed sexual differentiation of reproductive behavior, potentiating the expression of feminine sexual behavior and reducing masculine behavior." They also studied cognitive function in rats exposed in utero. Here their experiments revealed an enhancement in rat performance in maze tests, comparing treated animals to controls. Treated animals committed significantly fewer errors. Rice, DC. 1998. Effects of postnatal exposure of monkeys to a PCB mixture on spatial discrimination reversal and DRL performance. Neurotoxicology and Teratology 20(4):391-400. This is one paper in a series by Deborah Rice and by Rice and Stephen Hayward that explore the consequences of low level neonatal PCB exposure in monkeys for their subsequent performance in a variety of behavioral tests. The experiments involved monkeys that had been exposed at birth to different levels of PCBs. The exposures were within the range of levels measured in Canadian women (Rice did this work on the scientific staff of Health Canada, in Ottowa, Ontario, Canada). Specifically, blood PCB levels were 0.30-0.37 ppb for controls and 1.84-2.84 ppb for treated levels). This exposure was achieved by dosing the infant chimps with7.5 ppb/day of a PCB mixture representative of that found in human milk. Nagel, SC, FS vom Saal, KA Thayer, MG Dhar, M Boechler and WV Welshons. 1997. Relative binding affinity-serum modified access (RBA-SMA) assay predicts in vivo bioactivity of the xenoestrogens Bisphenol A and Octylphenol. Environmental Health Perspectives 105:70-76. Nagel et al. present data demonstrating that bisphenol A can alter fetal mouse development at extraordinarily low levels of exposure. Pregnant female mice were fed bisphenol A mixed in corn oil at two concentrations: 2 and 20 micrograms per kg of body weight (parts per billion). Prostate weight was then determined at the age of 6 months. 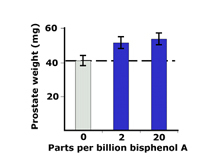 Males exposed to both levels of bisphenol A experienced an increase in prostate size. These results are profoundly important for two reasons. They demonstrate the remarkable sensitivity of fetal development to low level hormone disruption. They reveal bisphenol A effects on mice at levels, when corrected for body size differences, are within the range of bisphenol A regularly ingested by people as a result of the use of polycarbonate plastics in common products. vom Saal, F, BG Timms, MM Montano, P Palanza, KA Thayer, SC Nagel, MD Dhar, VK Ganjam, S Parmigiani and WV Welshons. 1997. Prostate enlargement in mice due to fetal exposure to low doses of estradiol or diethylstilbestrol and opposite effects at high doses. Proceedings of the National Academy of Sciences USA 94:2056-61. This paper establishes that low level variation in estradiol and DES can both effect significant changes in adult prostate characteristics, when exposure occurs during fetal development. Relative to controls, males treated with as little as 0.02 nanograms/gram (0.02 parts per billion) DES had heavier prostate glands. 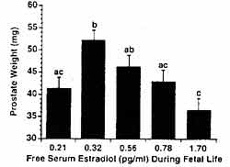 Relative to controls, males that experienced a change in free serum estradiol less of than one part per trillion had heavier prostate glands (by 27%), a 6-fold increase in the number of androgen receptors in the prostate, a 2-fold increase in the number of androgen receptors per prostate cell, and a 40% increase in the number of cells per prostate. Gaylor, DW. 1992. Incidence of developmental defects at the No Observed Adverse Effect Level (NOAEL). Regulatory Toxicology and Pharmacology 15:151-160. "The NOAEL is the dose at which it is judged there is no significant increase in the incidence of any important adverse biological effect." The NOAEL level is used to establish the reference dose, or RfD. Setting the RfD usually involves looking at animal data, determining a NOEAL, and then using a safety factor (for example, 10) to allow for greater sensitivity of some people compared to others. It is assumed that exposures at or below the RfD generally result in negligible effects. Gaylor asked about the incidence of adverse developmental for expsoures at the NOAEL level. He found that in 24% of cases, the observed risk of abnormal fetuses exceeded 1% at the NOAEL.